C’mon, his first miracle was transforming water into wine at a wedding feast! The religious of the day criticized him for the “riffraff” He kept company with. Accused Him of being a glutton. And a drunkard. 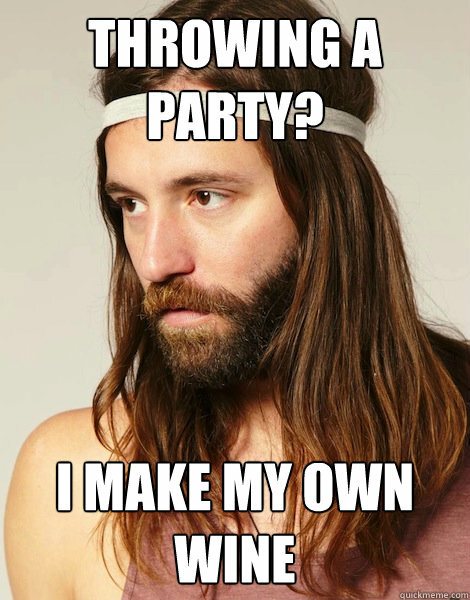 One thing about Him, Jesus knew how to have a good time. He understood the power of celebration in family-making. And inspired by all of our fantastic friends who love to make music together. It was a great night. We ate. We sang. We enjoyed one another. We were family. At one point, our housemate Chuk, came to the microphone, accompanied by one of my daughter’s friends on guitar. Smartphone with song lyrics in hand, Chuk began to sing. He got off to a faltering start, leaving us all on the edge of our seats, willing him to succeed. At the chorus, he got his groove on, and belted out the song with gusto. The crowd went wild! Happy bedlam. We celebrated his song, his success, his courage to stand up and sing. I see a lot of celebrations in GOHOP’s future. Festivity where we can celebrate one another, and celebrate God’s goodness to us. Let’s Wang Dang Doo it! Our friends, Peter and Sandy, at Little Bethel Church in Hamilton, were inspired by the weeks of 24/7 prayer we have been running the last few years. 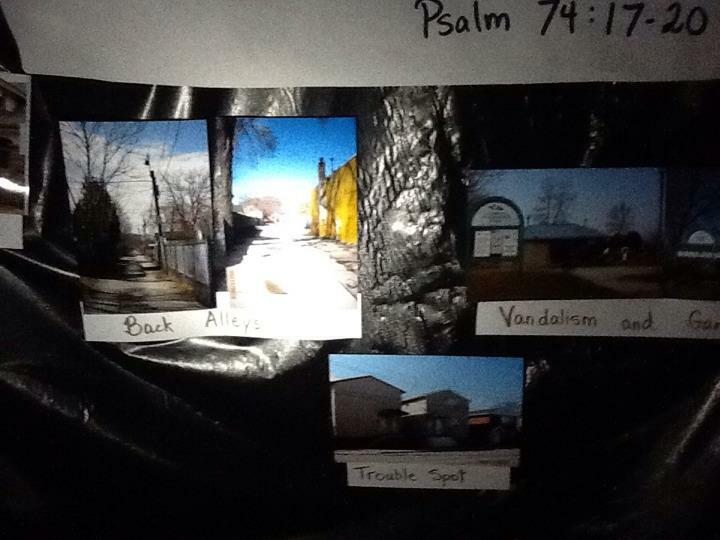 A couple of weeks ago they transformed their sanctuary into a prayer space for their east end neighborhood. For three days, members of the church and the community came in to pray for the local schools, churches, families, and neighborhood. 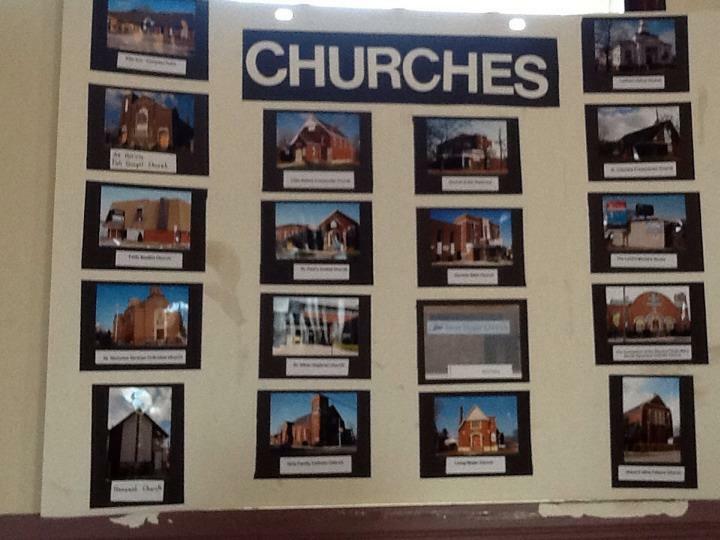 Here’s a video tour of the prayer space..
My personal fave on this one is the “un-named church” on the bottom left hand corner…. This was my very favorite thing in the prayer space. 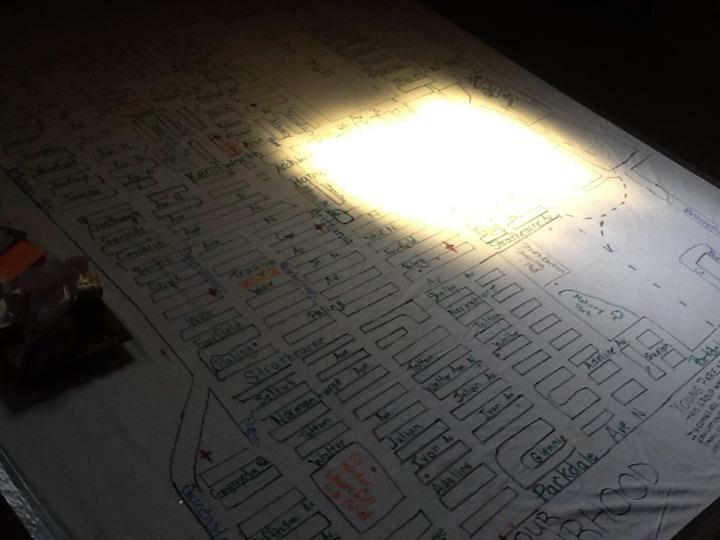 A large piece of canvas on the floor, with a map (to scale) of the neighborhood. You could put a sticker on your house (and I’m a sucker for stickers), and prayerwalk your neighborhood in a matter of seconds! In the centre of this photo is a “trouble spot”, an apartment building adjacent to the church that is a hot spot for crime and drugs. Little Bethel has been praying for this building for a long time, and took a photo of it to put in the prayer room, to invite others to pray along as well. When they were taking the photo, the owners of the building came out and asked them what they were doing. Peter and Sandy told them, and in the ensuing conversation, found out that the building was under new ownership, that the new owners were wanting to clean it up. Could Little Bethel bring a prayer team to the building to pray through it? You bet they could! 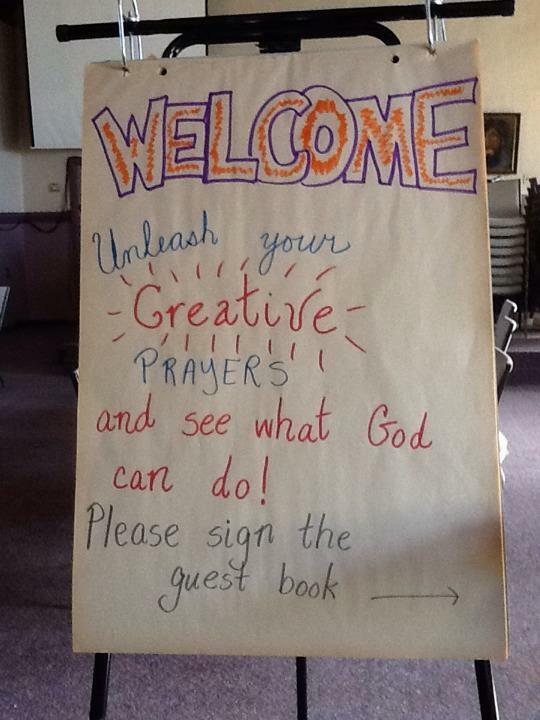 Wonderful, inspiring prayer project. Wouldn’t it be fantastic if every neighborhood got prayed for like this?